4 p.m., Dec. 20, 2004--Remember the first baseball game you ever saw? I do. The clattering express train ride to Philadelphia, the brisk walk to Connie Mack Stadium with my father and uncle, the dark concourses of the ancient ballpark giving way to the phosphorescent green of the field where the St. Louis Cardinals took on the Philadelphia Phillies in the summer of 1964. Do you know who pitched for the Phillies that night? David W. Smith, University of Delaware associate professor of biological sciences and baseball super sleuth, asks. No, I cant remember. All I remember is how beautiful the stadium looked, how the ushers kept chasing a guy who brought his own bugle on which to play Charge! and how when we left the ballpark, we did so on the field, passing the St. Louis dugout and then exiting through a large gateway in the outfield fence. Do you remember who won? No, cant remember who won, either. But I got a really nice pennant with a picture of the team on it. Then, memory begins to kick in like the answers on a Magic 8 Ball. Maybe Chris Short was the pitcher. He was from Delaware. Smith, the Sultan of Stats, logs on to the Retrosheet.org web site, where he and his colleagues have stored thousands and thousands of box scores and play-by-play accounts of Major League Baseball games from throughout the 20th Century. There it is in black and white, St. Louis at Philadelphia on Friday, July 24, 1964. Short did indeed pitch, winning 9-1 against the great Bob Gibson and the Cardinals. Another first game found for an appreciative fan. Every game is someones first game, Smith says, knowingly. In unearthing precious bits and pieces of baseball history, Smith is making a bit of history in his own right. 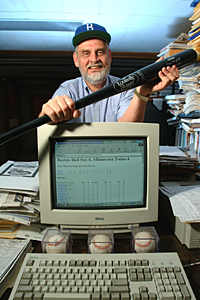 Smith and his unrelenting work with Retrosheet, which tracks down box scores and accounts of Major League Baseball games, have been featured prominently in two books and was highlighted in the Sept. 27, 2004, issue of Sports Illustrated, which also happened to be the 50th anniversary issue of the popular sports magazine. His work has enabled Smith, who grew up in Escondido, Calif., as a devoted fan of the Los Angeles Dodgers, to live out dreams beyond his wildest boyhood imaginings. He has met famed Los Angeles announcer Vin Scully and former Dodgers catcher Jeff Torborg, watched several games from the Dodger Stadium press box, has been provided credentials to watch ballgames from the press boxes of parks in nine different cities, and has a ball autographed by the principals in the perfect game pitched by Koufax, his boyhood hero, on Sept. 9, 1965. Smith started Retrosheet in 1989, hoping to fill in the yawning gaps in Major League Baseball history by sifting through old newspapers for box scores and play-by-play records. Beginning in 1984, several organizations began compiling baseball statistics on a systematic basis. Before that time, however, little or no work was done to compile key game information. For the period, Smith estimates that about 115,000 games were played. Today, Retrosheet has full play-by-play for more than 70,000 of those games and has retrieved information on 95 percent of the games played from World War II to 1983. This is far more than we ever thought wed get, Smith says. Part of the reason Retrosheet is so far along in its quest is the help of volunteers, who have signed on from Alaska, Ohio and Massachusetts. Smith recently enlisted the help of an interested UD student who had read about his work. The University of Delaware Library has played a huge role in the effort, Smith says, through the interlibrary loan program that provides access to historic newspapers in important baseball cities such as New York and Chicago. Smith says he is beholden, as well, to the saints at the library who help him scroll through the miles of microfilm. Prior to World War II, Smith says, most newspapers printed the play-by-play accounts of the entire game. The newspapers, particularly those that served the working class, had multiple editions with the last called the sports final. It carried the full account of the afternoons games for the men and women heading home from the stores and factories who, by plunking down 2 cents, could find out if their team won. Once Smith or the other volunteers have mined the data and found a missing game, it must be digitized for posting on the web site. Currently, there are about 60,000 games available online. When Retrosheet gathers the information, it is checked against the official record. Although it is not the organizations mission, Smith says the work has turned up a few discrepancies, and several have been taken forward to Major League Baseball. That, Smith says, can be intimidating. For Major League Baseball, the numbers are nearly sacred and many are politically charged. If you find a mistake in, say, Ty Cobbs hit total, they dont want to talk to you, he says. One number that was changed was the total of runs batted in by Hack Wilson of the Chicago Cubs in 1930. The official record showed Wilson had 190 runs batted in but the Retrosheet crew saw an indication he might actually have had 191 RBI. They found documentation to that effect and presented it to Major League Baseball, which accepted it and made the change. If he needs a push, Smith need only check his mail for a note of gratitude from one of the more than 500 fans for whom he has found information on their first game. Every game is important to someone, Smith says. Although Smith would like to have an account of every game, Retrosheet does list its most wanted ballgames. And, he personally is interested in getting the account of a doubleheader between the Baltimore Orioles and Philadelphia As played Aug. 31, 1954, in Philadelphia. Those two are the only Orioles games for which the organization has no record. And, he says he believes the goal is within reach. Collecting an account of every Major League game is a huge task, but it is a finite one, Smith said. Counting all the grains of sand on a beach would take forever, but with the game accounts there is an end point." In addition to the page-long story in the Scorecard section of Sports Illustrated, Retrosheet has been featured in the two books. 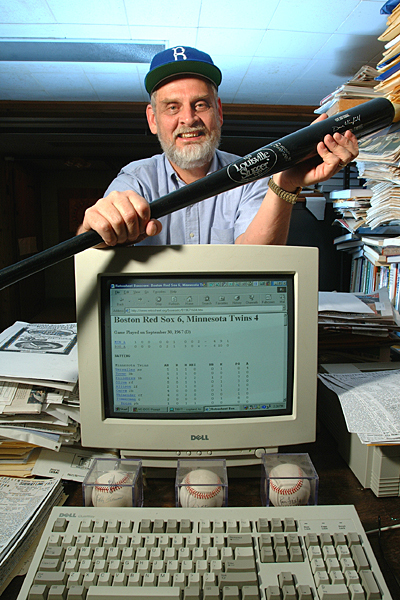 Alan Schwarz devotes five pages to the organization in his book The Numbers Game: Baseballs Lifelong Fascination with Statistics, praising Smith for both taking on the task and making sure the information would be free and accessible to the public. Smith, originally a consultant to author Jane Leavy, became a part of her book Sandy Koufax: A Leftys Legacy. As it turns out, Smith has what is possibly the only audiotape of the broadcast of Koufaxs perfect game. The book notes that he had a choice between staying home and listening to the game or seeing off a girlfriend who was heading to college. He chose the girl but left a reel-to-reel tape recorder running so he could listen to the game when he returned home, and Leavy weaves the tale of the tape through the book. Today, he has a ball autographed by Koufax, Scully, Torborg and Cubs pitcher Bob Hendley, who threw a one-hitter that day in taking a 1-0 loss. In helping Leavy with her research on the book, it became clear to Smith why printed accounts of ballgames are needed. Players remember things that didnt happen, he says. Ron Santo, who played for the Chicago Cubs in that perfect game, recalls that Koufax was so overpowering that in his first at-bat he just stood in the batters box and took three called strikes. Actually, he swung at more than one pitch and hit a pop foul for an out, Smith says. In addition to compiling baseball information and teaching, Smith is director of the Department of Biological Sciences undergraduate program, in which he coordinates curriculum and advisement for biology majors. He won the Universitys Excellence in Teaching Award in 1977.